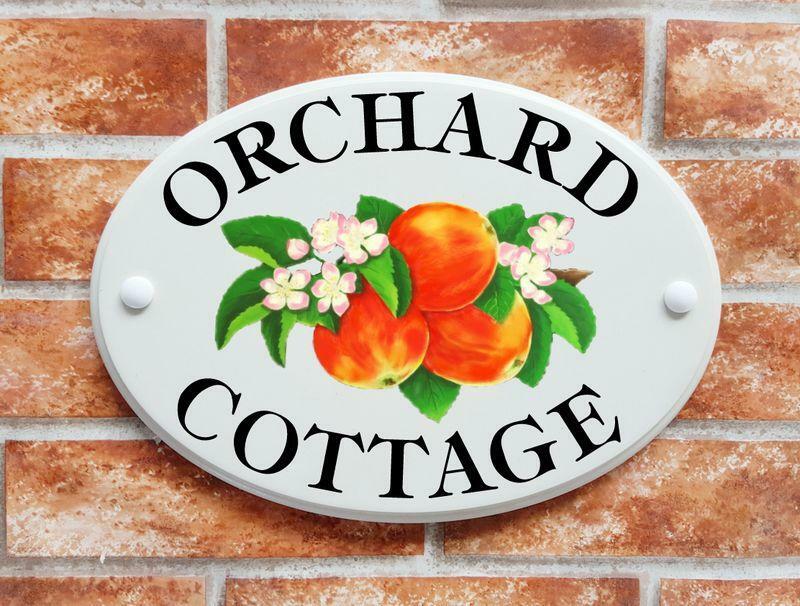 Whats the difference between our Hand Painted House Signs and our range of Picture Art House Signs? We have been making hand painted house signs for well over 2 decades now. They are a very popular way of personalising a house name plaque to our customers requirements. Our talented artists hand paint the subject the customer asks for directly on the base plaque and the house name and number are made from a white reflective text which will shine up from a distance when any light is directed to them. Over the years we found that many customer have seen some example on our house signs gallery pages and simply would like the same. We thought that if customer order the same pictorials over and over again why not create a generic pictorial design for the subject and offer it as a print on the base plaque rather than hand painting. This makes personalised decorative house plaques more affordable to the public. Below is an example of the generic apples and blossom sign which is a reproduction print on a white base plate. The main difference is the background colour. Because the apples picture on the white sign is printed with a digital UV resin ink printer the background has to be white to give true colours. If we printed the picture on a black background it simply would not stand out at all. We have made the printed white sign look like a ceramic house sign and the reflective hand painted sign to emulate a cast iron sign look. Both plaques are actually made from a solid casting of cultured marble which is completely weatherproof. The hand painted apples on the black background is painted with outdoor enamel paints which are weatherproof and fade resistant. The UV resin printing ink on the white sign is also weatherproof and scratch proof. The other main difference is the price. 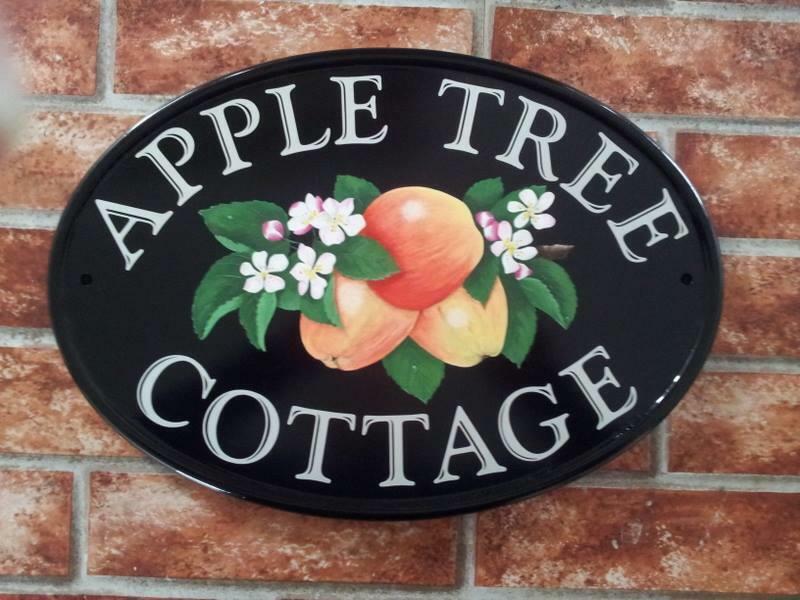 The black hand painted house sign with reflective text cost £137.95 due to the time it takes for our artist to paint whereas the white digitally printed apples motif reproduction with black text cost just £49.95 at an introductory price. A great saving compared with hand painting which makes our decorative house signs much more affordable. Obviously customers are limited to the pictures we have created for the digital printing method but the choice is expanding all the time. We feel digitally printed signs will fulfill a niche for personalized house name signs with generic pictures of various subjects whereas our hand painted signs will fulfill the demand for very individual discerning customers needs.